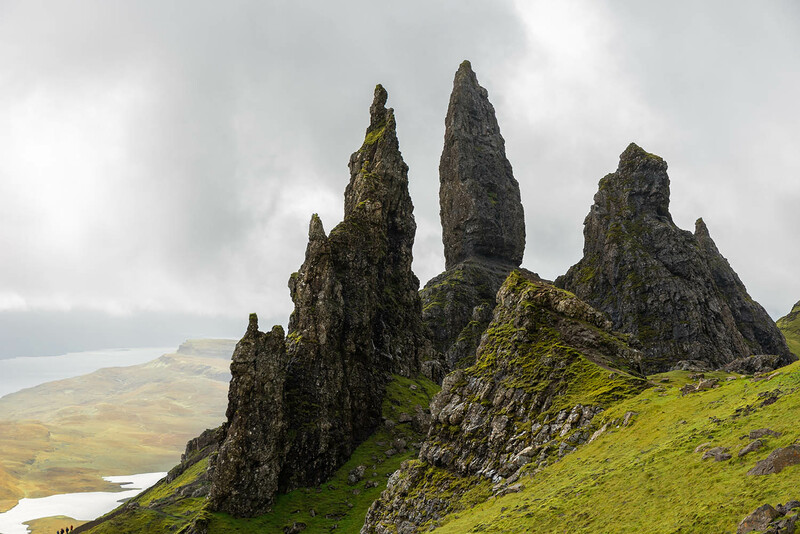 Locating the Storr is pretty easy, Just look for the giant, "Old Man of Storr," (the 'Old Man of Storr' is a giant, upright standing rock) rising from the horizon. Park your car on the street at the bottom and all the trails are uphill, Northwest, towards the Old Man. 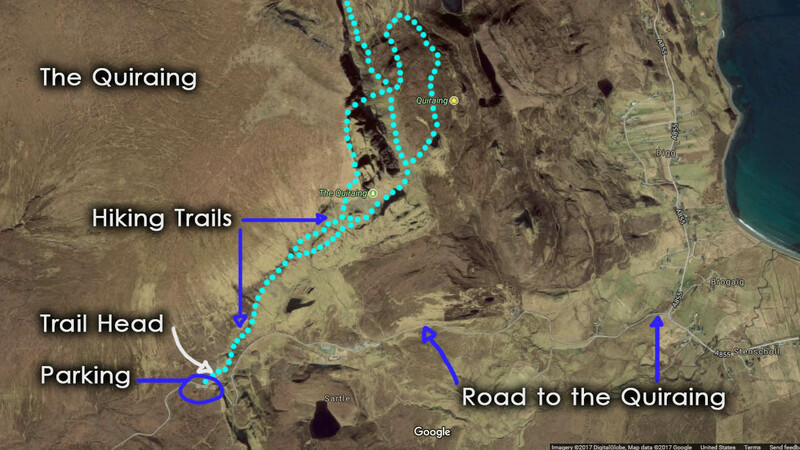 There are a few main trails that get you in to the general area, from here it is fun to choose your own adventure. You can get off the main paths and start exploring all the cool cliffs and rock formations on your own. 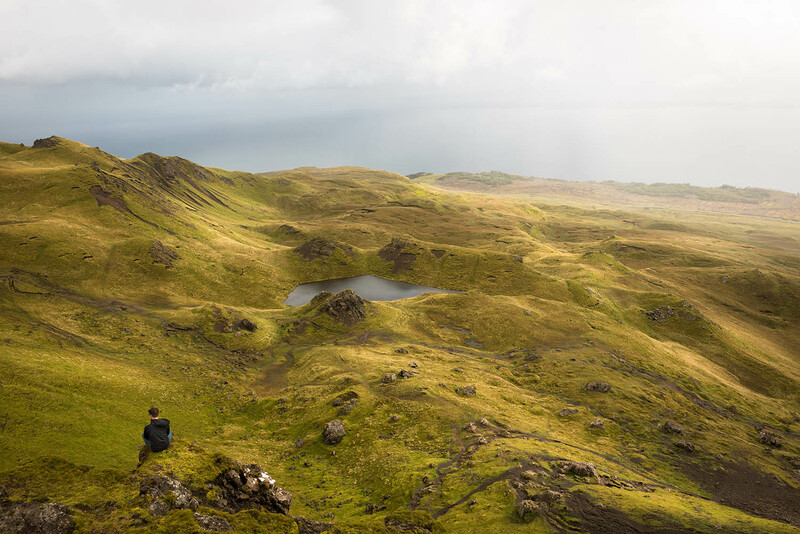 There are tons of interesting places most people don't see, and we easily spent an entire day hiking and climbing around the Storr area. 1. Bring some food in your pack, we got super hungry towards the end and Michael was the only one who brought something to eat. Luckily he is a sharing boy. 3. Bring a rain jacket. 4. Bring some boots, this isn't a good place for shoes, especially if you wanna go off-trail. 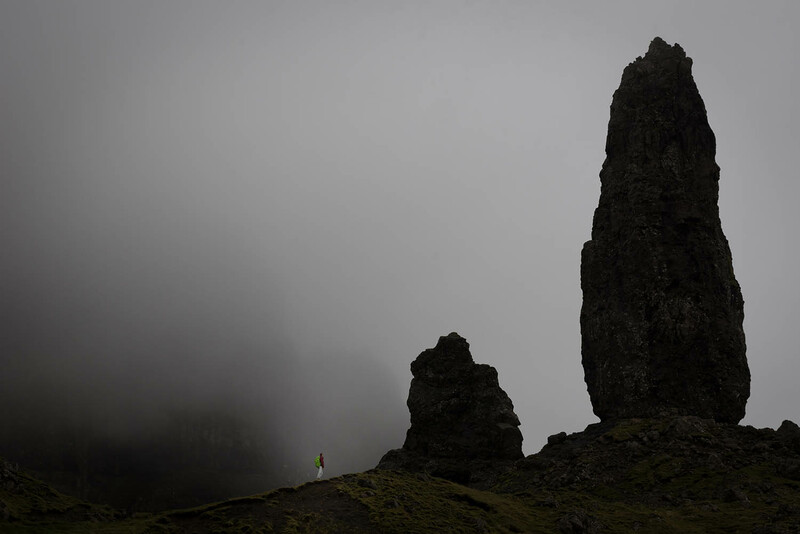 Michael standing below "The Old Man of Storr" a giant, alien-like rock. 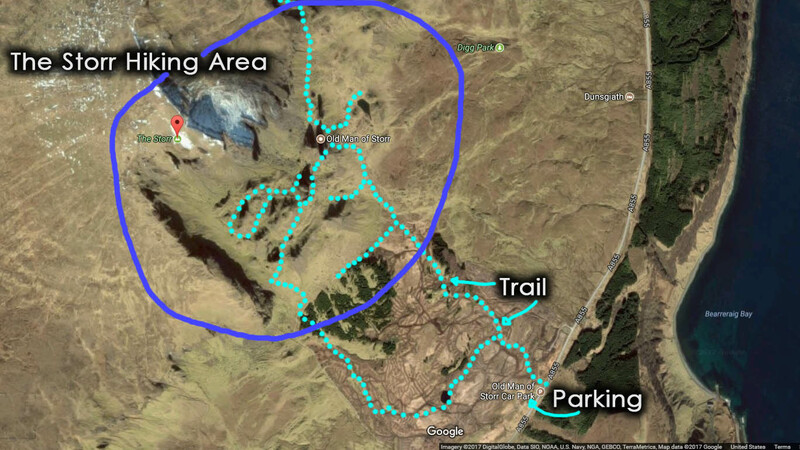 If you look at the very bottom left, you'll see us standing there on 'The Storr' hike. 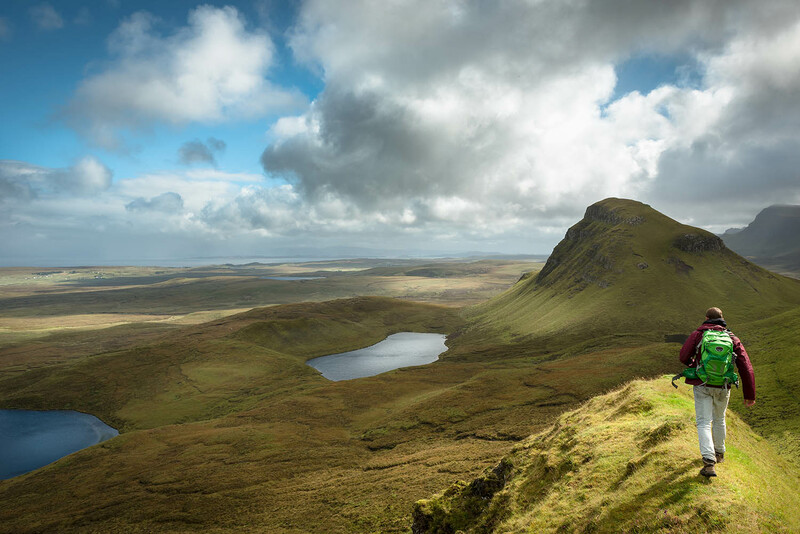 The Quiraing is probably the most beautiful Place in Scotland (Though, hard to choose!) What I love about the mountains here are that they are all covered in perfect, green grass. It's a really strange phenomenon. There are no trees or shrubs, not really rocky faces either. The strange landscape is what put this place high on my list of awesomeness. 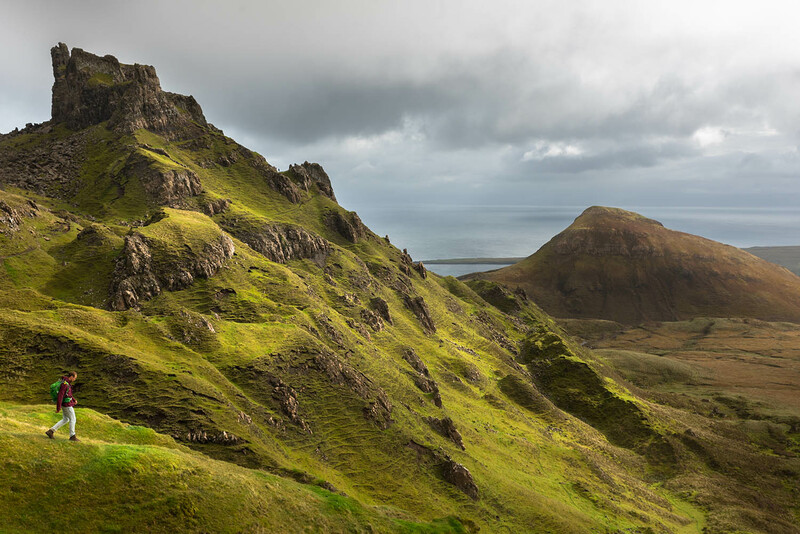 Similar to the Storr, at the Quiraing there are main trails and footpaths but you can adventure off the trail at any point. It was easy for us to spend a day here exploring places few people have ventured to. The weather at the Quiraing was crazy. While we were hiking all day, there were literally a dozen rain and sun cycles... It would be nice and sunny, and then rain would come in all of a sudden, drench you, then it would turn sunny again 20 minutes later. 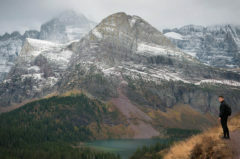 We could literally see the rain blasting in from the distance, prepare our packs, put our rain jacket on, hide my camera, get hit with rain, then the sun would come back out and we'd put away our jackets again. It was pretty weird how often this happened. Like I said, when the sun is out, this place is amazing... but be sure to bring a rain jacket. 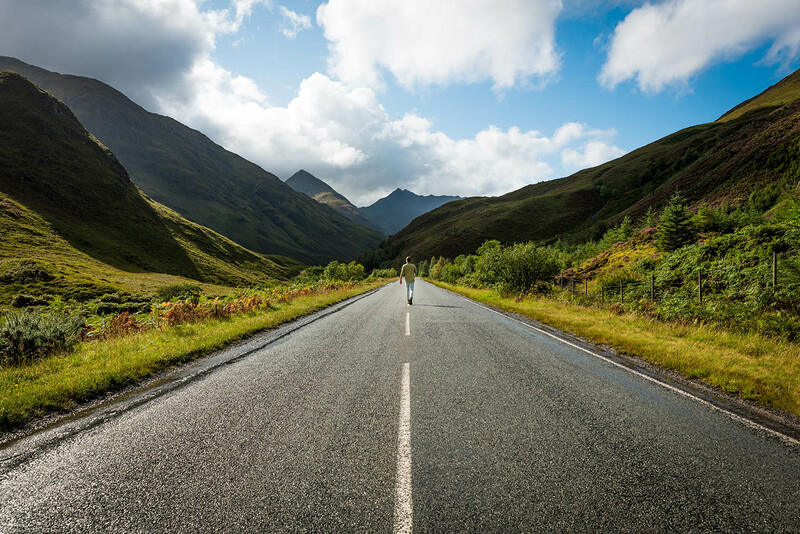 During our week in Scotland, our road-trip took us almost a thousand miles through the South, West and all over the Isle of Skye. Over the next day or two, as we headed towards the Isle of Skye we passed a bunch of cool castles that all offered their own perks. First, Kilchurn Castle. Kilchurn was definitely our favorite. Not necessarily because of it's size or grandeur, but because it is completely alone in the middle of nowhere, and you're 100 percent allowed to go inside and climb around it. 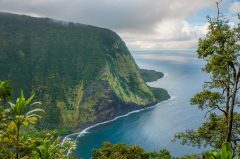 There are no entrance fees or employees. Just you and the castle, sitting in the middle of a golden wheat field, on the edge of a lake. 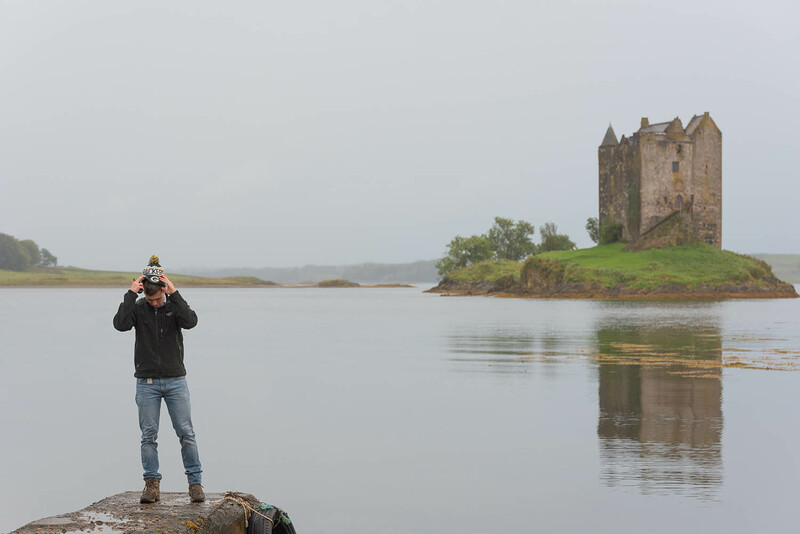 The most interesting castle we was was "Castle Stalker." This castle is crazy because it sits all alone on a little tiny, grassy island. Totally impossible to get to without a boat or a wet-suit. Me and Michael actually formulated a plan to swim there. We even had all the cameras rolling and the drone in a dry-pack for when we breached the island... It was about a 200 meter swim there, and then 200 meters back. We got our suits on, (not wet-suits, just normal swimming suits) waded into the water, our feet and legs instantly in terrible pain and then numb. Got 50 feet in, up to our chest in water and we were basically dying of hypothermia... Embarrassingly we had to turn around and completely abandon this plan and this filming project 🙁 This shameful spectacle did not make the final cut of our film, to say the least. One of the other castles of note on the way to the Isle of Skye was the Eilean Donan castle. This is probably the most picturesque and classic castles. The castle sits alone on an island surrounded by a lake and mountains. 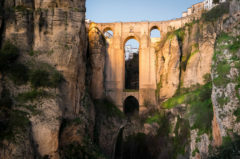 There's an old stone bridge that connects the castle to land. 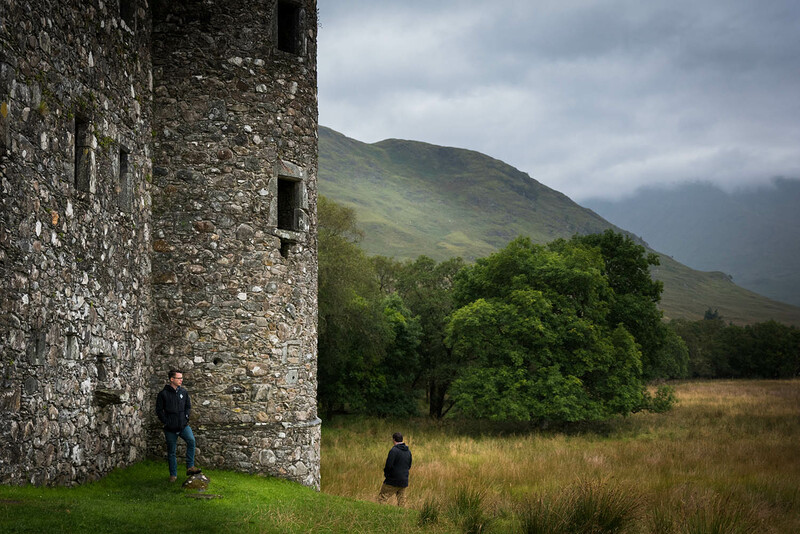 The difference between this castle and Kilchurn, is that the Eilean Donan is run as a business, with employees and entrance tickets sold outside the doors. This isn't really our cup of tea or in our budget but definitely still go to Eilean Donan to check it out. There were several other amazing places along our road-trip from Edinburgh to the Isle of Skye. 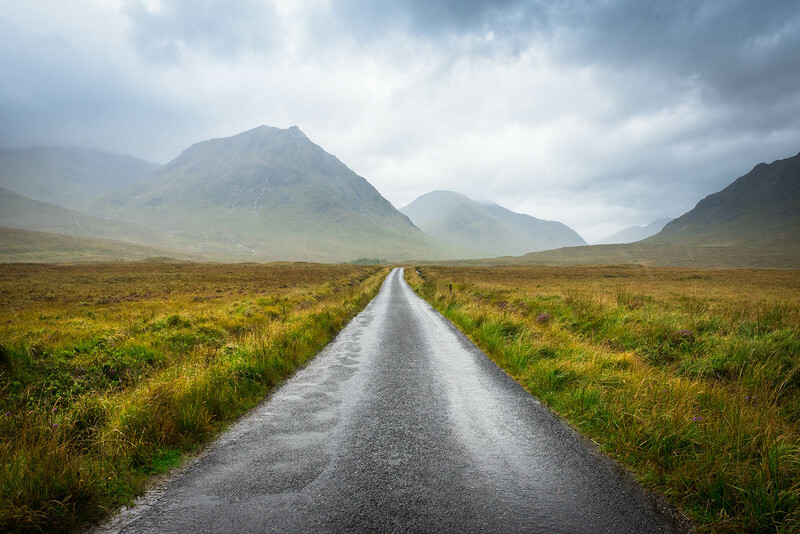 The next SUPER beautiful mountain valley was called 'Glencoe.' This is along the road to The Isle of Skye anyway so definitely drive through here. There's some interesting hiking in this area too but we didn't have much time when we were there. We did get out of the car for a bit to do a little skateboarding. Our last stop before the Isle of Skye was the Glenfinnan Viaduct. The Glenfinnan Viaduct is a really cool, old stone, arch train track bridge thing. 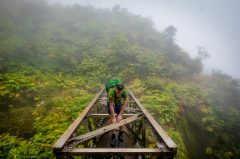 This bridge has been featured in the Harry Potter movies and for good reason, it's a pretty magical place. Even though we didn't see Hermione, and it was raining the whole time, it was still a great stop along our drive. Arriving at the Isle of Skye. 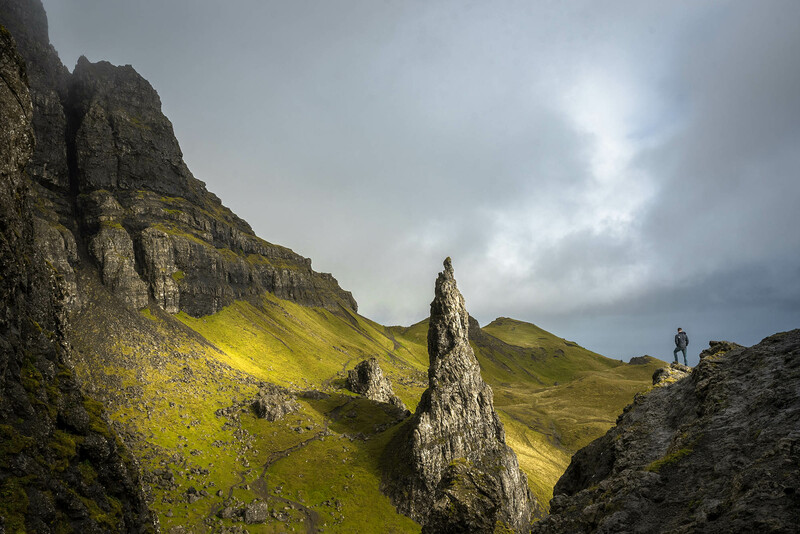 The main hiking attractions at the Isle of Skye are 'The Storr' and 'The Quiraing.' 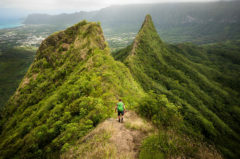 Both of these hikes are absolutely insane. The landscape is like nowhere else. 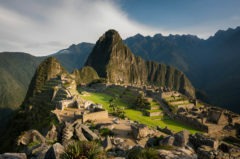 Perfectly green, grassy mountains in all directions, with massive, obscurely shaped stones jutting out from the hills. 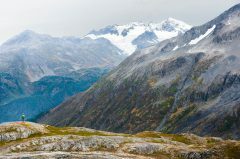 We climbed, hiked and filmed at these two areas over 3 days. These two places were major highlights on our trip to Scotland.